Looking for a Diecast Boss 429 ? Finding a high quality diecast Boss 429 has been difficult or impossible. But these cars were worth the wait. 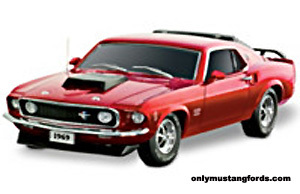 This diecast 1969 Boss 429, has to be one of the nicest offficially licenced diecast 1969 Mustang BOSS 429 replica cars you'll ever find. What's also unique about this Red Beauty, is the scale. 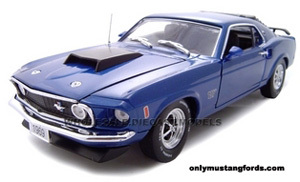 Unlike the usual 1:24 and 1:16 scale diecast cars which are typically the size you'll find when looking for top quality cars, this sweet limited edition Mustang offering, of only 2,859 cars was crafted at 1:12 scale.! At that scale, you know the detail of this exquisite show piece, has to be there. And That's evident right from the raised white letter Polyglas GT tires on chrome/black Magnum 500 wheels, to it's chromed hood locks and radio antenna. Attention to detail doesn't stop at the surface either. Look below and you'll find a nice authentic looking exhaust system with correct mufflers, orange Koni shocks and even detailed suspension bolts. If you're looking for a 1:24 scale diecast car, you'll appreciate the size and quality of this sweet little 1969 Ford Mustang Boss 429 , which is painted in the iconic Grabber Blue, with Boss 429 specific graphics and wide hood scoop. It also features some nice Magnum 500 wheels, front and rear air dams and the highly desired fastback window louvers. 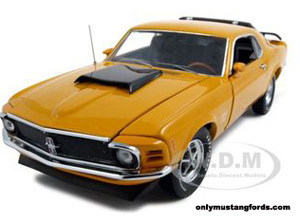 If you prefer the styling and look of the 1970 Ford Mustang, you may want to check out this cool limited edition 1970 Boss 429 Orange brought to you by the folks at the Franklin Mint. With a limited production of only 2,500 cars, this famous factory muscle car, features a nicely detailed Ford 429 V8 engine, wood rimmed rim blow wheel and deluxe interior package.